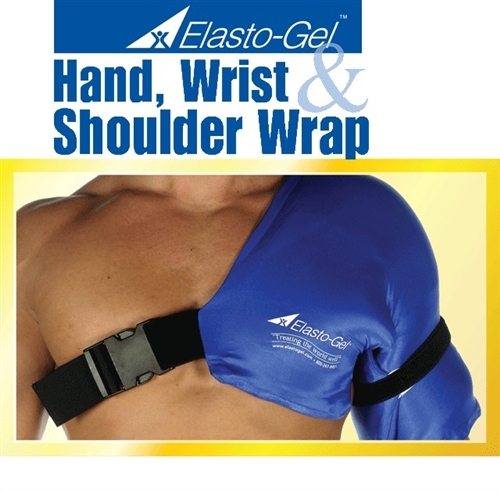 Elasto-Gel™ products may be used for either hot or cold therapy and will not leak if punctured. When heated, products provide moist therapy heat and when used cold, products provide soothing cold without causing trauma to the skin or nerves. In addition, when used cold, the products remain soft and flexible even at -20ºF. The products will not dry out, become hard or change form and are re-usable. The products have the ability to conform to all contoured areas and move with patient movement. Products are covered with a four-way stretch material that allows maximum conformity, heat transfer and comfort.The shoulder products are perfect for the hard to treat contoured area of the shoulder, upper and lower arm, upper chest and upper back areas. The product is universal for left or right injuries. 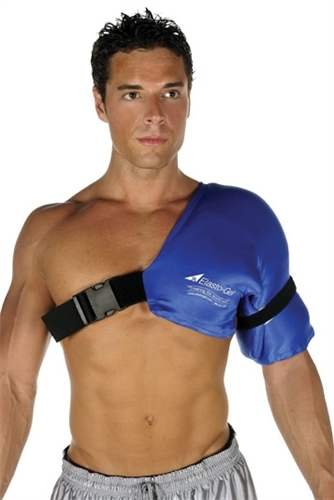 The user may perform a series of arm movements or excercises while wearing the shoulder product as it is totally flexible and held comfortably in place. The shoulder sleeves are easier to put on by oneself. Product is sold by the single unit. COLD THERAPY Store the wrap in the freezer for a minimum of two (2) hours. It may be left in the freezer indefinitely until ready to use. It will remain flexible even at -20°F. Remove the wrap prior to defrosting the freezer. Note: Always store product in a plastic bag while in freezer. HEAT THERAPY The most convenient method of heating the wrap is in a microwave oven. Suggested heating times: 600-700 watt microwave: 60-90 Seconds. Flip the wrap to the opposite side and heat for 60-90 Seconds. Then refold the wrap (inside to out) and heat for 45 Seconds. 1100 watt: 50 Seconds per side. Note: all microwaves vary in heating and may have “hot spots”. Be cautious when heating. Wait one minute (60 seconds) before using. The wrap should feel WARM to the touch, NOT HOT. Hold the wrap firmly against the skin for 30 seconds before re-heating*. If the wrap is not warm enough, heat in 20 second increments and rotate the product each time. The wrap can also be heated in a conventional oven at 250°F for 15-20 minutes. Place wrap on cookie sheet or baking dish in the center of the oven. Do not allow the straps or buckles to touch the heating element. Rotate the wrap after 6 minutes, top to bottom and if folded, inside to out.